Has tooth discoloration caused your smile to lose its luster? When your teeth darken, it is easy to feel insecure about your appearance. You may find yourself hiding your mouth when eating, speaking, or smiling. You do not need to hide behind the stains. You can achieve the drastic, lasting results you want with teeth whitening in Grapevine. Smiles By Martin provides the convenient and effective solution you need with an at-home kit. You can enjoy professional-quality results from the comfort of your own home. Over the years, you will notice the color of your teeth changing because it is unavoidable as you age. Daily wear and tear cause your enamel to thin. This makes more of your yellowish dentin become more visible. Besides age, there are other factors that can lead to discoloration, like poor oral hygiene habits. Among the leading cause of stains involves the foods and drinks you consume. Those that are darkly pigmented or acidic makes the color of your teeth change quicker. In addition, tobacco can significantly impact the brightness of your smile. To combat the changes, you have likely given a few over-the-counter whitening products a try, but you were left dissatisfied with the results. Although they are affordable and convenient, they do not contain professional-grade whitening agents, so they cannot deeply penetrate your enamel. Any change you see will be minor and it will not last. Thankfully, you do not need to live with a discolored smile. Your dentist in Grapevine has the solution you need. Now, you can achieve in-office results from the comfort of your own home. Unlike over-the-counter products, our whitening system contains a highly-concentrated whitening agent to penetrate below your enamel to resolve stubborn stains. You need an initial consultation to ensure you are a candidate. You cannot have untreated cavities or gum disease. Then, Dr. Martin gives you everything you need to whiten your teeth around your own schedule. 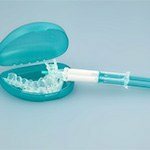 You are given custom-fit trays to ensure your comfort and the even distribution of the whitening agent. This helps you achieve consistent results. You use the trays and the specially formulated whitening gel every day for about 2 weeks. At the end of the treatment, your teeth can be as much as 8 to 10 shades whiter if you follow your treatment plan correctly. Your results can last for several years if you take the time to care for it properly. Besides maintaining your home oral hygiene habits, it is best to limit your contact with stain-causing factors, like coffee, tea, and berries. If you cannot skip them, brush your teeth right away or rinse your mouth with water. It is also best to avoid smoking to prevent new stains. If tooth discoloration is weighing you down, you can reveal a brighter smile with our take-home kit. Invest in your self-esteem with whiter teeth today. Contact our office to schedule your consultation.